I brought this up on Twitter a week or so ago. I'm very interested in a big book of game mechanics for kids 4-8. I really want a simple visual guide for them to start understanding game theory. Does anyone know if this exists? Examples? Do other people think this would be worthwhile? I feel pretty strongly about it, so I'm considering taking it on after my upcoming kickstater. Happy to not though, and just buy one! Game theory book for age 4-8? I don't see the need/demand for it. Here's my son at age 6.
it's not easy to understand, but he clearly has a concept for the game he is designing. But I wouldn't want to put him through a book at all; at least, not at that age. Maybe in middle school. I gave him the older version of components and grid maps. My son at age 4... we had visited the "Yucky Germs" exhibit at Discovery Place (kids museum), and I recently (tried to) teach him and his cousins Pandemic. So.... yeah. Color me intrigued by the idea of a game mechanic book for kids. I'm still not sure there's a demand for it, but here I am giving you examples where it is possible to be useful. edit to add: I gotta say this... a child's greatest resources are his parents. So a book on game theory that can educate a parent and help them relate the concepts to their kids might make for better reception. I'm not suggesting that a kid needs to go read a book and come back, but rather have a nice resource for parents (and designers for that matter) sit down and explain some of these concepts to kids in a way where they are actually learning the concepts, language, influence of these mechanics. Basically, I was working with my son (6) on his work book for first grade. He is doing a ton of sophisticated things which I feel I wasn't learning until 3rd grade. None of it however has anything to do with understanding game dynamics. It isn't being taught, I wish I had better fundamentals, I'm trying to think of a way to promote this. Good, sounds like we're on the same page, then. On the contrary, I'd say that anything that requires a decision, a calculation, or even a hint of imagination ... any of that is at the basis of games. Have you taught your son the game of Rock Paper Scissors? I think most people think that it's all purely random. But the players do make individual decisions. Those decisions might be in their subconscious, but it is a decision nonetheless. If you figure out how your opponent thinks, you stand a good chance at beating them consistently, even in a game of Rock Paper Scissors. My wife used to beat me consistently (as in: all the time) ... but I've started winning our games recently, especially when we play more than 5 hands. By contrast, Tic Tac Toe is a game that can be consistently played to a draw, once both players have figured it out. But until each player figures that out, it remains a fun game for them (and a big bore for the other player, if he already knows how it will turn out). Those two games, in my opinion, are a great starting point for kids to explore game design. I'll have to take a step back and rewind my memory to what I exposed my own son in terms of games that got him hooked into my hobby. I'll post again when I remember what came after RPS and TicTacToe. Both my kids know how to play that game, but I haven't actually sat with them and broken down what is happening. I've done that with other things, but I agree those are good places to start. Understanding the dynamics of simple things can often be quite eye opening. Sitting and talking about rolling dice of different size and the impact was a good one. The Exploritorium also has a massive dice rolling simulator which helped him understand that overtime things level out. There are some "Big Book of Games" that explain the rules, a little history, and have the parts to play some older games (checkers, nine mens Morris, etc.). For that age, I think this would be an approach to take. Maybe explain a game, and define a mechanic, then offer a blank page for the kid to draw a board and use the mechanic, or a multiple choice set of rules the child can choose. More of an activity book than encyclopedia. As to how worthwhile it would be, my 8 year old has loved to design games for about 2 years. Before 6, he still loved to play games, but I think it took awhile for him to try enough games before he realized that he could create his own. I feel he is comparable to other children (as all parents would say), so that makes me think it would be more worthwhile at the older end of your goal. oooooh! That's a good one! I haven't really explored that with my son. He's seen different sized dice, but most of the games we play use d6. I haven't managed to get a clear sequential history of the games I've introduced, but one of the early ones is Risk. I definitely missed the chance to show him the fine balance of the 3 attacker vs 2 defender dice roll. Then again, he's extremely lucky with dice rolls. I'd have a hard time convincing him that "things level out" with the way his luck works so much better than mine. Anyway, another one of our early games is Forbidden Island. As you've seen, I tried to do Pandemic at age 4 (and his cousin was 6). It was only partially successful, and I blame the big scale of that Pandemic map. Forbidden Island worked a lot better. Biggest advice I could give here is : "Let them fail." I think today's parents have a hard time allowing their kids to make mistakes; but the advantage of playing games is that it has that safety net of "let's play again and see if we can do better." On the first 2 games, I only correct them on things that they can't do. I bite my tongue at telling them what they could/should do. This kind of cooperative game is pretty great at that age 4 to 8 range, in my opinion. The kids don't have a strong competitive streak yet ... or at least, my son and his 2 cousins he plays with don't really compete too much against each other. It's fun to watch them realize that they need to help each other out to collect those sets. More of an activity book than encyclopedia. That's my gut reaction as well. Especially when it comes to "scientifically" exploring game mechanics. On the other hand, my personal experience seems to prove that it is worthwhile to start that exploration process even at the tender age of 4. I think it helps to push that "eureka" moment that he can make up his own game ... even if he's just "toying" with things. My son's favorite toy has been LEGO, and when the Heroica series came out, we started looking for discounts. I feel that the game that came with it could use more meat, but it certainly provided a good foundation to build on ... and tons of components to flesh out many ideas. There seems to be a wealth of examples here - all of which are different. Maybe it is more of a list of 10 intro games, their key mechanics, and a couple "teaching moments to watch for" examples. I know we all do our best as parents to teach, but I do find it helpful to have a rounded list or book to make sure to hit all the important elements. ---- "low cost, low setup time, low cleanup"
---- Just as kids are getting a handle on hierarchies (small, big, bigger, etc), it's an interesting twist to introduce this ... what would you call it? Tactical wheel? ---- introduce games with pen and paper, games with a "board"
---- to be honest, I hate this game. But it's better than Candyland or Chutes&Ladders. There are still some interesting choices to be made. Besides, we gotta practice our manners. And counting steps properly. ---- played semi cooperatively as a "puzzle" game. "Hey, your tile would fit perfectly here!" ---- great Jr. version. Not a lot of reading needed. ---- see Yucky Yucky Germs. ---- I do have to admit, however, I had to help him read and understand the cards. Once he memorized what a card did, he didn't need to re-read it. Wonderful memory these kids have! ---- All of these games can really be played with minimal reading. And they're great introduction to the realm of "miniatures gaming" since they have pretty simple movement rules. I think WizKids made some great games here. I think I might even have introduced Crimson Skies at age 5, but I'm not sure. ---- I bought the game and intended to play it with my wife. Then I decided that I can retheme it with Disney's Frozen. That version worked well with my nieces (6yo and 9yo) as well as my son. I added a link. It's a video, my son imagined his own game. I've finally introduced my 2-weeks-before-3-year-old daughter to boardgames; and the introduction came in the form of Sorry! Sliders. It's one of the very very few dexterity games I own, and there's a good mix of strategy, luck, and manual dexterity skill. So, yes, in comparison to my son's "training", we just did a couple of games of Rock Paper Scissors, skipped TicTacToe, and replaced Sorry with Sorry-Sliders. To clarify a little, I think that playing games with kids is absolutely fantastic and a big part of what I keep in mind when I make games. ([Lift Off! for example: http://bit.ly/LOKSFB). I think this thread has become an excellent list of fantastic products to ease young players into game and make them fantastic game players. Maybe this IS all that is needed. Still, I guess what I originally was talking about, was something to help teach young game making apprentices about the fundamentals of game design and using it in creating games. Again, may be that the best thing young is to just drive great interest. Like a foreign lanugage though, I wish I understood this stuff more clearly when I was younger! I really want a simple visual guide for them to start understanding game theory. Just for the record, game theory usually refers to the branch of mathematics that analyzes strategic decision-making, and while it has some relevance to playing board games, it's probably not quite what you meant here. Wikipedia has an article on something called game studies that might be more what you had in mind. You might also find combinatorial game theory to be of some interest. Many of the games studied with CGT could probably be played by kids 4-8 (e.g. nim, dots-and-boxes), though I don't know how much of the theory itself they could grasp (e.g. there's a cool trick for solving nim, but it involves binary arithmetic). Yeah - I'm not talking about Game Theory in that sense. Game Studies is probably closer. Thanks for clarifying. Ed, I think really the best preexisting way to describe what you're talking about, especially game mechanics and how they work withing a game, would just be either by talking about game mechanics (so how you started this thread), or just plain ole game design with a focus on mechanics (in contrast to theme/aesthetics). I'd say any decent game needs at least two out of three of those to come out well (with notions of complexity and replayability being shuffled into 'mechanics'). Certainly as games increase in complexity they can rapidly plummet in nightmarish play or ascend to those higher calibers, and simplicity can have the same result. Ed's game Lift Off! Get me off this Planet! definitely is the close shave of just enough complexity to not be a children's board game (Sorry! Cluedo, etc. ), but not so complex as to prevent younger players, with the kinds of aesthetics that are generally pleasing in all the right ways. I'm not entirely sure how you could engagingly put together a book about game mechanics, but you certainly could make a series of GAMES about introducing game mechanics (although of course just finding the most watered down games with various mechanics could do the job as well). I think there is a difficult gap between the level of complexity in hobby board games and the sorts of board games we all played as children that you can't meaningfully gap with simpler games (at a certain point a worker placement game just would become garbage if you simplify it too much). Okay, that's enough rambling, Ed, I'm sure you don't need to read through another one of my rants, heh. It is an interesting idea to do it as a series of games. Much more work, but very interesting. Kickstarter is sucking braincells, but I want very much to do something with this idea. Always willing to chip in some neurons when needed Ed. Strangely enough ... I had an interesting sequence of events recently. which was one the 5 Mensa Select game winners in 2009. I've now introduced Tic Tac Ku to my 8 year old son ... and so far, he has won 2 games, and I've won 2 games ... and we're enjoying it immensely. Paper napkins in restaurants and fast food chains are once again in danger of being repurposed as Tic Tac Toe boards! In hindsight, it might be something I could have taught him at age 6 or 7. And it certainly is a good game to help pave the way for Chess. I'm now in the process of puzzling out how I can make a "Altoids Tin" version, so that we can play while standing in line. 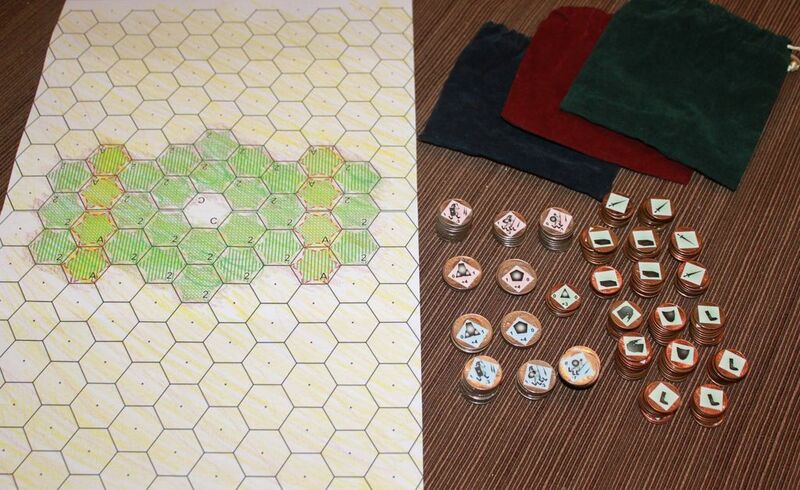 But there's always the option of making pre-printed mini-pads of the gameboard from Artscow or similar service.